Here are five green-thumb tips to make sure your plant stays as leafy green as it was the day you bought it. 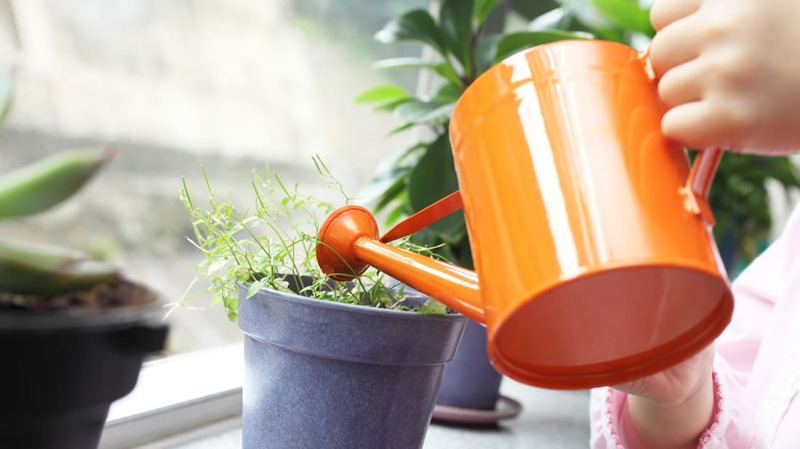 You don’t want to neglect your plant, but it’s easy to go overboard with the watering can, and that can be just as harmful as forgetting to water your plant for weeks. A watering schedule can help you keep track of whether or not your plants need attention, but you shouldn’t water just because it’s Sunday and that’s when you usually do it. Before you go to water your plant baby, make sure it actually needs it. Your plant’s water needs will vary based on the type of plant, its location, how old it is, and plenty of other factors, but there are a few rules of thumb that can put you on the right track. Lift the pot. If it’s heavy, that means that the soil is full of water. If it’s light, it’s dry. Dig a finger into the soil around its roots, making sure to feel beneath the surface. Still damp? Hold off. Dry? Grab the H2O. If you really struggle to strike the right balance between too much and too little water, consider a smart plant system. And regardless of how often you water, make sure to use a pot with good drainage to prevent root rot. Be aware of where your plant is situated in the room, and whether there might be any temperature extremes there. Is your fern sitting right above the radiator? Is your peony subject to a cold draft? Is your rosemary plant stuck leaning against a window during a snowstorm? As a rule, most houseplants can handle temperatures between 58°F and 86°F, according to a bulletin from the University of Georgia. The ideal range is between 70°F and 80°F during the day, and between 65°F and 70°F at night. Below 50°F, sensitive plants can suffer damage to their leaves. However, as with most plant advice, it depends on the species—tropical plants usually do well in higher temperatures, and some other plants are happier in colder rooms. If your sad-looking plant is sitting in the middle of a cold draft or right next to the heater, consider moving it to a different spot, or at least a few inches away. If it’s near the window, you can also draft-proof the window. Not sure how humid your house is? You can get a humidity gauge (known as a hydrometer) for less than $10 on Amazon. 4. LOOK OUT FOR BUGS. Even if you do all of the above correctly, you can still struggle to keep a plant healthy due to infestations. Keep an eye out for common pests like spider mites, which will leave brown or yellow spots on leaves or make the plant’s color dull. If you discover these tiny mites (you may need to use a magnifying glass), wash your plant immediately with water to knock off as many mites as possible. Wash the plant with an insecticidal soap, too, but make sure the label says it’s effective for mites. 5. DON’T DISCOUNT THE POT. Healthy plants often outgrow their homes. if you notice that there are roots coming out the drainage holes at the bottom of your pot, or that water sits on the surface of the soil for a long time before draining down, or that your plant’s roots are coming up out of the soil, it’s time to upgrade to a bigger pot. Signs of a “root bound” plant whose root system is too big for its container can also include wilting, yellowed leaves, and stunted plant growth. No matter what the size of your plant, it’s good to repot it once in a while, since the nutrients in the soil deplete over time. Repotting creates a fresh nutritional start and can help perk up unhappy plants. If your plant looks unhealthy and you're still stumped, try consulting the website of a university horticulture department for other signs of plant distress and potential solutions.